That is it! Run your app and enjoy! First websocket example worked. Thanks. How would you send Json to the server though? Does not seem to work? Can you offer advice on how to structure a form that has an interactive transaction (like the example) in one panel, and a running multi-receive panel in the other, e.g., a discussion forum that updates as new items are posted? Need to have all on the same connection, with a decision on message receipt as to which control to post to. I get connected successfully but the message sent is not echoed back, even after adding the cross-thread fix. What’s wrong? Sorry, my bad, my listBox1 was not set up correctly to add items. Now it’s echoing just fine. Thank you. 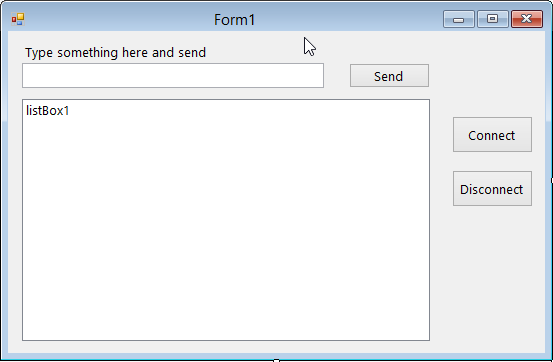 I’s possible to change, on the fly, the websockets server, in a winform application?